Face masks are such an odd category of things. They purport to do so much but really they just sit on the top of your skin for five to thirty minutes, so I always wonder how much good can they really do? What can they really change? One mask I used for a while was so good at pulling goop out of my pores from deep underground, that within two to three days after using it my skin would be so broken out (which is a good thing, I mean I don’t want that stuff staying there) but still, it was almost too powerful. I’ve been using another mask for about five years, once or twice a week, I’ve been using Fresh Umbrian Clay Treatment, I love this stuff. It keeps my skin clear, purges my pores, it basically keeps things in line. I have gone through countless tubes of this stuff. I keep coming back because its basic, not harsh and just very simple, and really no other clay mask can hold a candle to the Fresh stuff. That was until I tried the Pangea Organics Facial Mask with Japanese Matcha Tea with Acai and Goji Berry. A long title for something so good. This stuff looks like dirt paste on your face and will frighten anyone who lives with you, but the change in your skin is so dramatic, that I am now completely obsessed. After my first use, I talked about it to anyone who would listen. After my shower, I generously slather this stuff on and I wait until its dry, or until I am ready to take it off, which is about ten to twenty minutes. What happens after is nothing short of a magic and has totally changed the game on face masks for me, while my Fresh mask prevented breakouts it does not do anything really thats instantly noticeable. 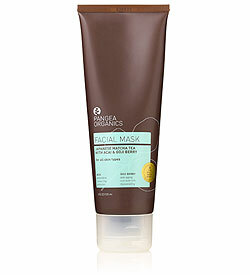 This mask by Pangea makes my face instantly better. I mean instantly as in within twenty minutes, but still. Once I wash off the mask, my face is generally less red, more glow-y, brighter, even toned, somehow more relaxed, my face simply looks better. And the effects of the mask last a few days. I am totally in love. Before I had never really used a mask or a treatment that delivered such results, including Dr. Dennis Gross Alpha Beta Daily Face Peel. This one, Ren Glycol Lactic Radiance Renewal Mask, delivered results but they really didn’t last. With the Pangea mask, the after effects are totally noticeable and they are really that amazing. Also, I don’t experience reactive breakouts, and generally since I’ve been consistently using this my skin has been much clearer and less red. While I will keep using my Fresh mask to help keep breakouts at bay, the Pangea Mask is great at working on the early signs of aging, poor diet and lack of exercise, things I should probably be working on anyway, but thats another story, so until I start eating better and working out on the regular, I’ll keep using this mask to fake it.